Boat launch to Turtle Bayou at White Park. We will put in at White Park and attempt to paddle a tributary to Turtle Bayou (see beginning of paddle in red below), if it is not blocked by fallen trees. This is a nice protected paddle of about 6-8 miles round trip. We will then take a break at the put-in and have lunch/snacks. For those who want to make it a short trip, they can exit at this point. 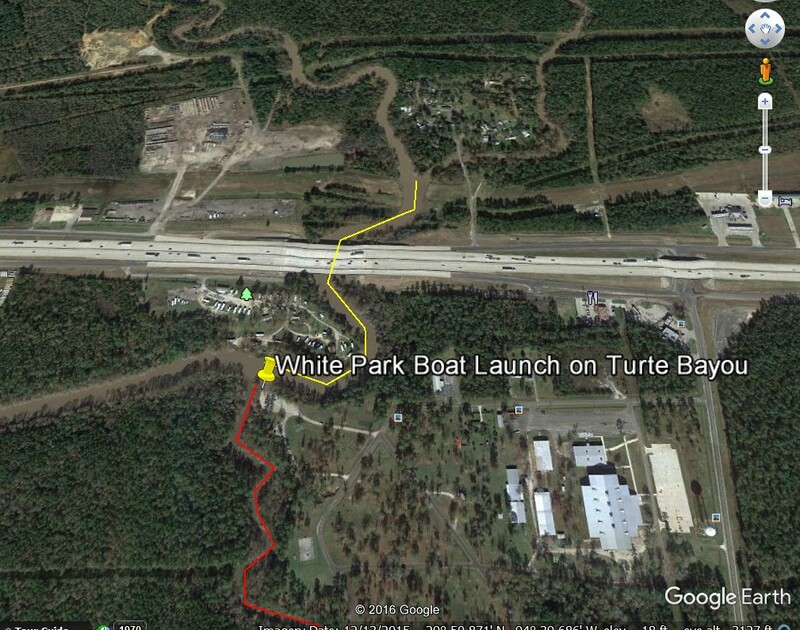 For the rest, we can travel up Turtle Bayou and explore the upper reaches of Turtle and/or White Bayous for another 6-8 miles round trip (see yellow path below which takes us to the split of White and Turtle Bayous). Driving directions: Drive 44 miles east of downtown Houston on I-10 and Exit onto Texas Hwy 61 south at Exit 812. Drive south on Hwy 61 about 1/10 mile and take the first right into White Park. Make a right turn onto a dirt road which takes you to the boat launch. Drop off your boat near the boat ramp. Let's meet at 10:00 and launch at 10:30 a.m. Bring lunch, water, sunscreen and dress for possible immersion although this is not part of the official trip plan. Hazards: The route is a fairly safe route with a decent boat ramp to launch from. The ramp may be slick. Light boat traffic in Turtle Bayou. There will be submerged logs and some low hanging branches along the banks. The water will be cool, so a set of dry clothes should be carried in case of emergency. Remember to dress for possible immersion.